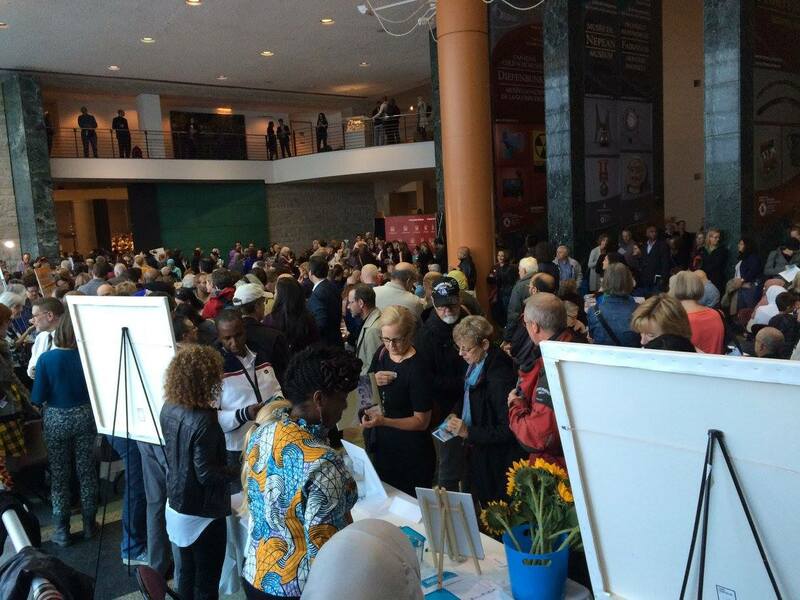 A forum on refugee resettlement drew a more than 1,500 people to Ottawa City Hall last October. It’s a little over three months since the Government of Canada began expediting the resettlement of Syrian refugees in Canada, celebrating the open door with the government’s newest hashtag: #WelcomeRefugees. Two months since Prime Minister Justin Trudeau waited late into the night at Toronto’s Pearson International Airport to help the first planeload of newcomers into warm winter coats before sending them on their way. And one month since the government reached the halfway-mark toward its self-imposed deadline of receiving 25,000 Syrian refugees by March 1. As of this week, 20,490 Syrians have arrived in Canada since the airlift began (check out the most up-to-date data from the government’s tracking site) and almost 5,000 people to land in the next couple of weeks. After that, another 10,000 to 25,000 are expected to arrive over the course of the year to reach the somewhat vague target of 35,000 to 50,000 by the end of 2016. Compared to the 4.7 million Syrian refugees in Turkey, Lebanon and Jordan and the millions more displaced within Syria, Canada’s numbers seem paltry, barely even worthy of mention. And yet it is a massive undertaking for this country of 35 million — on track to be the largest influx of refugees to Canada since the end of World War II. We certainly look good next to the United States which, with almost 10 times the population of Canada, is planning to take in just 10,000 Syrians this year. We are quite happy to give ourselves a big pat on the back for our generosity (even if it is due to a new leader’s stubborn adherence to an ambitious election promise). Just, please, don’t throw Germany or Sweden in our faces. We know have distance and geography on our side (hopping a dinghy to cross the Atlantic to Canada is not a popular route to asylum) and we are quietly grateful to have the luxury of time and control they give us. What does it look like when a country opens its doors to refugees in this way? So far, it’s a big, complicated, messy operation that has seen its fair share of hiccups and snafus — along with galvanizing moments and scenes of simple welcome, the kind that teach you both the good and the bad about your new home and help you feel like you belong. At first, the public discourse focused on the “colossal” government effort required to identify, process and transport 25,000 refugees by last Dec. 31 (the initial deadline, which was later pushed back to March 1, a more realistic but still ambitious target). The mainstream assumption was that refugees were standing on the tarmac, ready to embark for their new life. So it came as a shock — though only to those outside settlement and immigration circles — to learn that displaced Syrians weren’t climbing over each other to be first in line, and that in fact many were not interested in the offer at all. This is not new. Old hands recall similar dynamics in previous refugee airlifts, from the Ugandan Asians in 1972, to the Vietnamese refugees in the early 1980s; a trickle of the bold and the curious that turned into a river once word got back that the destination was, in fact, an improvement on the status quo. That slow phase soon passed, and by December arrivals were picking up pace. The majority of the airlift refugees are government-assisted refugees (GARs) — meaning they are selected and funded by the federal government for the first 12 months, and supported by settlement agencies working on the government’s behalf. More than 40 per cent of the new arrivals — almost 9,000 people — have been brought in under the private sponsorship of refugees (PSR) program in which individual Canadians are matched with refugees pre-arrival and play a direct role in their resettlement process — a proud and uniquely Canadian tradition (that’s what we are always being told, so if you have evidence that other countries have the same system, send it in. Seriously – I’d love to know). Under the PSR program, citizens form groups of five or more to provide full or partial funding and assume full logistical and social support to the refugee for 12 months. Private sponsorship was previously something of a fringe activity, something a few hundred groups sprinkled across the country did with quiet dedication in the face of ever-increasing bureaucratic hurdles and ridiculously long wait times. Now the government is speeding up the sponsorship process and publicly singing the praises of refugee sponsors, and their ranks have grown into the tens of thousands. In Ottawa, where I live, it feels like everyone knows someone in a sponsorship group — through their church congregations, Muslim associations, neighbourhood groups, friendship circles or professional networks. More than 600 people took part in information and training sessions for sponsors in Ottawa last December, and more were on the waiting list. This new breed of sponsor is attacking the role with gusto, creating committees to organize housing, education, interpretation and health care, setting up Facebook pages, lining up apartments and houses, painting second-hand furniture and greeting their newcomers at the airport with signs, gift bags and flowers. It all began when the photo of Aylan Kurdi’s body (warning: heartbreaking image) on the beach in Turkey flashed around the world last September. Aylan’s family was trying to reach Canada, and Canadians responded by mobilizing around Syrian refugees in a way that astounds and delights those who toiled for so long to bring their attention to the refugee issues. 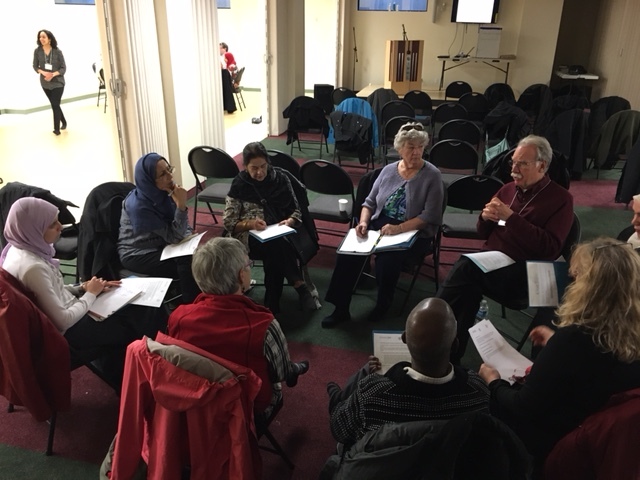 A member of the Anglican church’s working group on refugees shares his knowledge of refugee resettlement with private sponsors during a workshop at an Ottawa mosque. The project I work for, Refugee 613, supports community resettlement efforts with information and coordination of ideas and partnerships. We launched within a month of Aylan’s death at a forum on refugee response organized by our mayor and attended by an estimated 1,800 people, each of whom wanted to know how to help. Almost five months later, the waves of compassion just keep coming. Refugee 613 now has a mailing list of 6,000 people — in a city of 1 million — and more than 5,000 of those people have asked to volunteer. They all want to support the 2,000 Syrian refugees Ottawa expects to receive by year’s end (in addition to the 500 to 800 refugees who arrive in the capital from the rest of the world annually) and they’re frustrated it took time to get rolling. It isn’t just sponsorship — a significant investment in time and money that is not for everyone — and it isn’t just Ottawa. Across the country, Canadians are donating clothes and furniture (even when overwhelmed settlement agencies ask them not to), holding benefit concerts, collecting toys, bringing home-cooked meals for move-in day and donating money and vehicles to support settlement programs. They are volunteering to provide Arabic interpretation, skating lessons and soccer club memberships, introducing refugees to the great Canadian pastime of tobogganing, designing web platforms to help refugees find housing, even donating temporary housing. Doctors, nurses and volunteers are sharing refugee health expertise, while schools scramble to expand their newcomer programs. Large or small, hundreds of communities want their opportunity to support Syrians and at times demand outstrips supply. Towns that have never had a refugee resettlement program faced off against the traditional reception centres, insisting they get their own refugees. As a result, Victoria, BC and Sydney, Nova Scotia are among the new destinations for the airlift passengers. Still, it hasn’t been just hugs and gratitude. The reception centres for the GARs quickly filled up, and hotels have been turned into temporary centres to take in the overflow. The traditional waiting period of 10 to 21 days between arrival and moving to permanent homes has been extended in many cases, primarily because of a shortage of housing that is both affordable and big enough for the large families arriving. At first a few stories appeared in the media, speaking of Syrians trapped in hotels, anxious and lonely, their children hanging out in the lobbies with nothing to do, the food not to their liking. Since those early days, more programming has been introduced in many centres to keep kids occupied, and community volunteers have stepped up to support recreation or educational activities. The handful of racist or Islamaphobic hate crimes that have been reported were soon smothered by a backlash of love. The bottom line is one that was unthinkable just six months ago, when the word “refugee” was often accompanied by the word “bogus” or “queue jumper.” Canadians who never thought about immigration, let alone refugees, suddenly care enough to put their money on the line, to educate themselves, to press for improvements. People who have owned their own homes for decades are discovering how tough and expensive the rental market is, because they have to help a refugee find a place to live. People who have never had trouble finding work are discovering what it’s like to look for a job in a place where you have no network. Canada has done this before. Many of the people stepping up now did the same for the Ugandan Asians, or the Vietnamese, or the Kosovars. Many recall not doing as much for the Somalis, and how that tepid welcome has played out over the years. As with each of those waves, the ripple effects of this experience will be felt for a generation, and not just by the newcomers from Syria or those working closely with them. Mainstream Canada is being schooled in the refugee experience. We’re learning what it means to be a refugee, from Syria, from Iraq, from Eritrea or Congo: the dislocation, the financial struggles, the loss mingled with hope. We’re building bridges between Canadians old and new, and learning a bit about the world in the process.